Are you in Beta and getting ready to move to production? Did you already publish your prices on your website? Or are you thinking about running an extended Beta testing period for your new app? Well, you only get ONE chance to exit Beta… don’t screw it up! Luckily – now that you have this information – you won’t screw it up! Before we go any further, I have to say this… I’m not a fan of “Beta” testing beyond actual testing of the app for a short period of time before you launch. Rather, I’m a big believer in many of the Lean Startup principles, with the big one being to get a Minimum Viable Product (MVP) – one that you get paid for – to market as quickly as possible so you can start learning from real, actual paying customers. What you learn from non-paying customers will be VERY different than what you learn from customers that fork over their hard-earned money. So get there as quickly as possible. 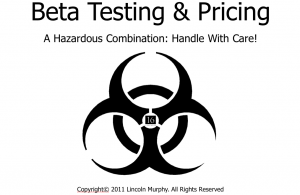 However, if you’re interested in Beta Testing and how you should deal with Pricing – that is should you announce or post your pricing during the public beta testing phase – then this Master Class I did back in 2011 on Beta Testing & Pricing is for you. In this ~25 minute presentation that I pulled together for a group of SaaS entrepreneurs literally overnight, I cover most of the pitfalls and problems to avoid; so you don’t have to figure it out on your own and hurt your business before you even get started! As you go forward, consider Public Beta as just an early marketing phase for your Web App. It might be the first marketing phase for you. Or it might be a later marketing phase, following a time of building interest and buzz, signing-up potential testers, doing the whole invite thing, etc. Like everything else you do, “Beta Testing” as we do in SaaS these days is less about testing the product, and more about customer development and MARKETING… here you go! Do you prefer to listen on the go? Download the .mp3 audio file (24MB) here. Want to see the example sites I was talking about? Watch the ~35 minute Beta Testing & Pricing: Examples presentation video. I hope this helps you avoid some of the pitfalls others have encountered as you get your venture off the ground!